The first yearlings arrive at Oaklands tomorrow ahead of the Inglis Premier Yearling Sale that will kick off next Sunday 28 February. Swettenham Stud will be the first to begin parades, with their 40-strong draft available for inspections in Barn F from 12 noon Monday 22 February. Another 29 vendors will arrive and begin parading Tuesday, with nearly 400 yearlings from the catalogue available for parades by 12 noon. The bulk of the catalogue will be parading by 9am Wednesday 24 February. CLICK HERE to access the Vendor Parade Schedule. All yearlings offered at the 2016 Inglis Premier Yearling Sale are eligible to be nominated for the lucrative $5 million Inglis Race Series covering their 2YO, 3YO and 4YO racing seasons. 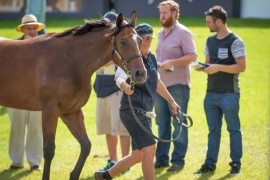 Online Bidding and Inglis’ Make-An-Offer services will be available on all four days of the sale; Sunday 28 February through to Wednesday 2 March 2016.